Layout Manager: David Rook - Deputy Manager: Chris Orr A few years ago a small N gauge layout was donated to the club following the sad death of a club member. 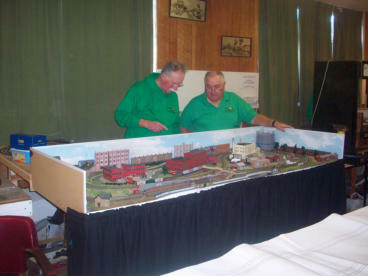 The original ‘on a door’ plan had its limitations and the decision was made to modify it by removing the high level terminus station but adding a high level fiddle yard on a new board at right angles. A new bridge leading to the fiddle yard has been built and the track realigned. On the lower level a loop has been removed and replaced by sidings which will serve a dairy and malting. The original analogue wiring was very complicated and this has been removed and the layout rewired for DCC operation using a simply Bachmann E-Z controller. The points will continue to be operated conventionally using Seep point motors. Although with DCC the track is meant to be ‘live’ at all times we have installed short dead sections approaching each point so that it is not possible to drive a train through an incorrectly set point. Dapol magnets have been installed in the two sidings to allow for ‘hands off’ shunting. The new fiddle yard has been built and track work laid for the three reverse loops, which should hold at least 6 trains. Thoughts are now being given to the scenery whilst the track is being fully tested before ballasting. The period of operation is planned to be the green diesel era of the early to mid 1960’s somewhere in the East Midlands. At the present time only a limited number of appropriate DCC fitted locomotives are owned by the members but it is anticipated that the number will grow as more models are marketed as DCC ready or DCC fitted. We have experimented with fitting decoders to older models but not always successfully. As none of the involved members have any previous experience with DCC we are learning as we go along. 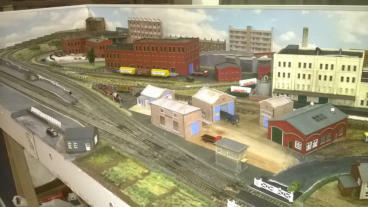 There are three main structures in the centre of the layout representing, from the front, a dairy, a maltings and a telephone exchange/depot. Various green liveried diesels appear on the layout on which work has now started on the scenery.